Lying, misleading, deceiving, obfuscating... it’s what politicians do best around election time. But if there’s one thing I know people across the heartland hate, it’s a phony. Case in point: when Senator Jon Tester was caught in a lie recently after claiming to be a big supporter of hunting in Big Sky Country — even sending out mailers that show him on his farm with a gun in his hand — real Montanans caught on to the truth quickly. In reality, Tester hasn’t had a hunting license in years. According to the Montana Fish, Wildlife, and Parks records, the last time Jon Tester was legally allowed to hunt was the last time he was up for reelection. Coincidence? I think not. You see, that senator won’t hunt. These revelations shouldn’t surprise Montanans. Tester has changed his tune dramatically over the years that he’s been in Congress. He left behind his Montana values many years ago and adopted the beltway buckle — caving to the Democrat leadership in Washington, time and time again. 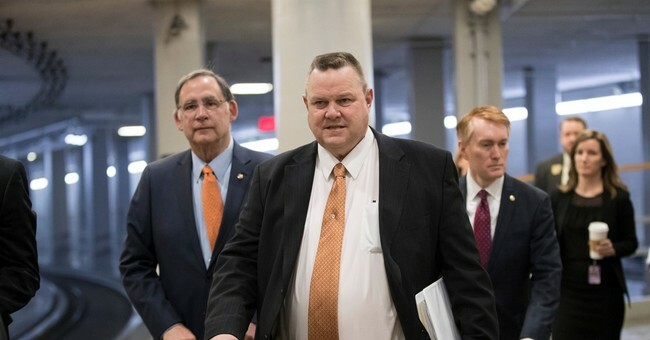 The moderate demeanor Senator Tester displayed early in his political career has been transformed by his association with the likes of Chuck Schumer. In fact, he votes with the Senate Minority Leader nearly 85 percent of the time — aligning him closer to voters in New York than his own constituents in Montana. And Tester has had a well-established pattern of opposing my father when he could have used his support the most — on tax cuts, immigration, healthcare, and the Supreme Court. Any time a tough decision needed to be made, Tester instead united with his liberal allies in Washington. This coziness with the establishment elite is nothing new for Jon Tester. He and his wife joined Minority Leader Chuck Schumer and his wife on an exorbitant trip to Cancun, Mexico in February of 2016 for instance, at the expense of Missouri’s “Air Claire” McCaskill. Airfare, hotel, and food alone cost $15,000 for the two couples. Nice work if you can get it! As if that weren’t enough, Tester also rakes in the dough from lobbyists. The senator is an outspoken critic of the influence of money in politics, but that hasn’t prevented him from collecting more lobbyist donations than anyone else in Congress this year, a feat he also accomplished in 2012. And, of course, it was earlier this year when Tester hurled unsubstantiated accusations at former Physician to the President, Admiral Ronny Jackson who was actually appointed by Obama. This was just one of many times that Jon Tester chose to carry the water for the Democrat leadership in the Senate over the interests of his fellow Montanans. All of this highlights the need for Montanans to support Republican Senate candidate Matt Rosendale. Instead of people like Tester, who say one thing and do another, our communities deserve representatives who don’t establish a false facade every election season. When Rosendale says he stands up for Montana’s hunters, he means it. Matt won’t misguide them, take them for granted, or pander to them. He also has a great relationship with my father, which will pay off nicely for the people of Montana. Matt knows the President has his back, and together they can continue to make American great again. My father needs a team player who will work with him to continue to expand our booming economy and protect our constitutional rights such as gun ownership, and Tester has proven to be anything but that. The Senator’s real hunting season is only every six years when it’s time for him to run for election again. The truth is, he’s just a charter member of the swamp, especially as the number one recipient in the U.S. Senate of cash from DC lobbyists. Luckily, on November 6th, voters can elect someone who will fully represent them — and doesn’t just pretend to when he’s hunting for their votes.